Previously (and uncomfortably) co-starred in Polly at the Circus, Marion Davies and Clark Gable were reteamed in Cain and Mabel, reportedly on the demand of Davies' "sponsor" William Randolph Hearst. The story concerns a hash slinger-turned-Broadway-star named Mabel O'Dare (Davies, endearingly miscast) whose career is in the hands of hotshot publicist Reilly (Roscoe Karns). 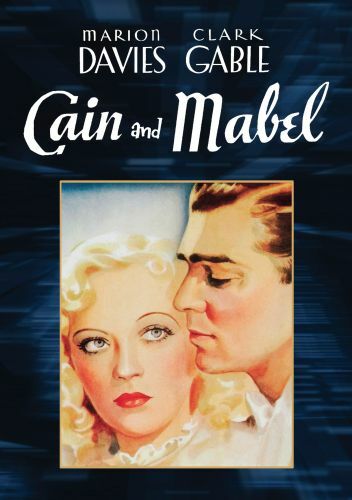 To stir up interest in Mabel's latest musical show, Karns cooks up a phony romance between his client and boxing champ Larry Cain (Gable) -- even though Mabel and Cain have already developed a healthy dislike for one another. Unfortunately, Karns' brainstorm turns out to be a drizzle: Mabel's show is a flop, and Cain begins losing in the ring. By the time Cain and Mabel have fallen in love for real, both parties have had to virtually abandon their careers as proof that it is for real. Most of the comedy setpieces in the film fall flat, save for a terrific bit near the end: Told that "The show must go on!," a disconsolate Mabel asks "Why?" -- and no one can come up with a good answer! This is the film in which a studio stagehand allegedly pops up during one of the production numbers, but don't kill yourself looking for him. PS: The handsome actor billed as David Carlyle later enjoyed a substantial screen career as Robert Paige.